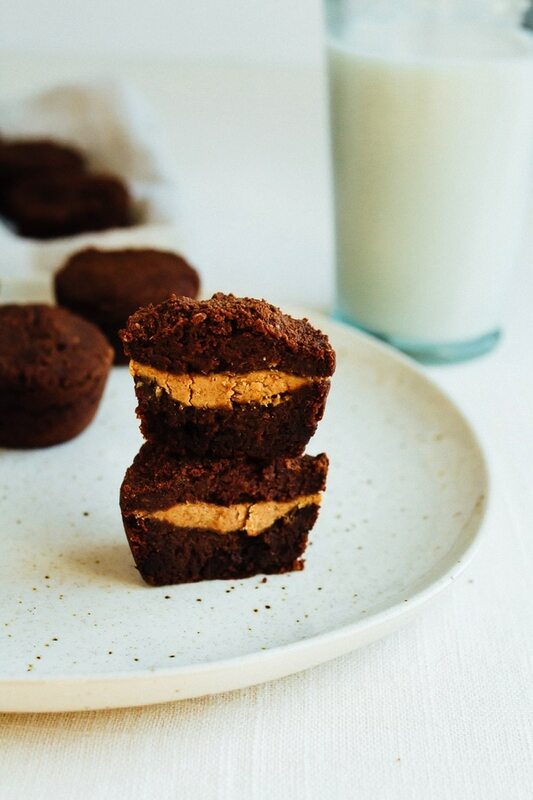 Sneak some veggies into your brownies with these vegan + gluten-free sweet potato brownie bites. No one has to know the secret ingredient. I’ve always had a love for sweet potatoes, but the day I figured out just how good sweet potatoes work for making decadent gluten-free brownies that love was magnified by 1,000 percent. Seriously, I’m hooked on these healthy sweet tater brownies. I’ve made them so many times already and I don’t think I’ll be slowing down any time soon. Especially given the fact that the holidays are right around the corner and I always turn into a baking queen as soon as the season hits. The baking has obviously already started. 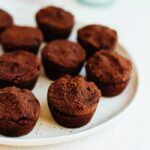 I stumbled upon the idea for these sweet potato brownie bites through listening to podcasts about intermittent fasting and carb cycling, two health/fitness trends I’ve been researching more about lately. One interview I listened to was with Michael Morelli, the author of The Sweet Potato Diet. He mentioned one of his favorite recipes for sweet potato brownies and I immediately became curious and had to try them. They were rich, delicious and super fudgy. Here’s proof. Anyhow, we loved Michael’s recipe, but I started toying with the idea of doing a vegan version and maybe turning it into a skillet brownie recipe. I made cast iron skillet sweet potato brownies and they were a big hit at a workout happy hour I attended. However, I tragically burned my arm on the skillet, which made me reconsider that whole idea and try brownie bites in a mini muffin tin instead. I love the crunchy edges of brownies and I figured cooking the bites in a mini muffin tin might lend itself to more crispy edges. I should probably just buy one of those brownie edge baking pans, but I don’t make brownies nearly enough to justify it. Plus, the muffin tin works great! Turns out Maria and I like the vegan version of these brownies even better than the original. Using maple syrup instead of honey gave them the perfect amount of sweetness without having that pronounced honey favor and the flax eggs worked great in place of regular eggs. I was a little worried because coconut flour can be fickle without eggs, but this recipe worked like a charm. On the day of the photo shoot we decided to have a little fun and stuffed some of the brownies with a bit of almond butter. This is totally optional, but definitely a fun addition if you want to add a rich and unique component to the brownie bites. Everything is better with almond butter… amirite? Preheat oven to 425°F. Pierce sweet potato with a fork in 2-3 spots. Wrap in foil and roast until tender, about 30 minutes. Let cool. Peel sweet potato and mash with a fork. Measure out 1 cup of mashed sweet potato for the recipe and save the rest for something else. Add ground flax to water and whisk together in a small bowl. Set aside for 5 minutes to thicken. Lower oven temp to 350ºF. 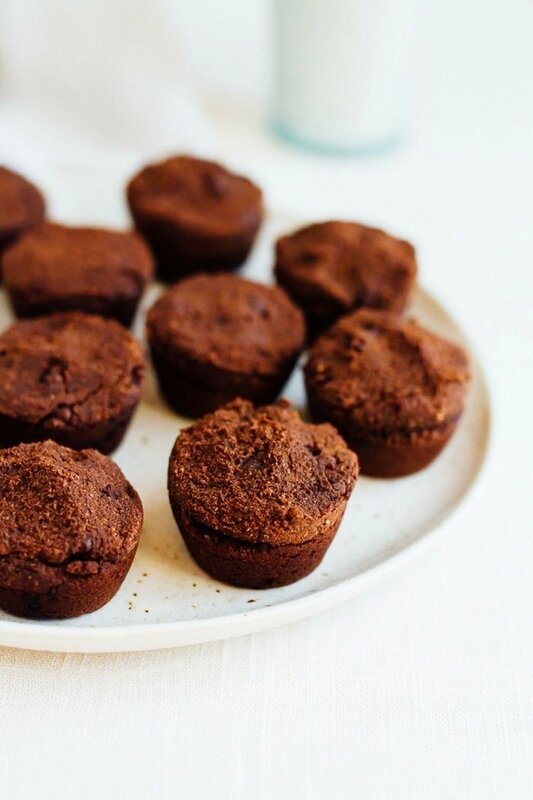 Lightly coat a mini muffin tin with coconut oil. Add mashed sweet potato, maple syrup, coconut oil, flax eggs and vanilla into a large bowl and stir to combine. Add flour, cocoa powder, baking powder and salt. Stir to combine. Gently stir in chocolate chips. 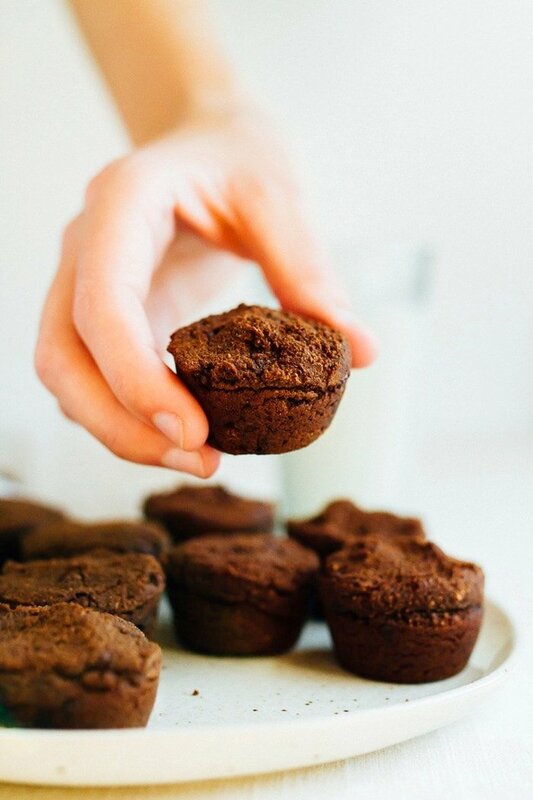 Drop batter into the wells of your greased mini muffin tin and bake for 20 minutes. Brownie bites are done when you can insert a knife and it comes out clean. *For the almond butter stuffed version, simply add a little of the brownie batter to the muffin tin and make a tiny well with your finger. Add a 1/2 teaspoon of almond butter to the well and cover with more brownie batter. **Inspired and adapted from The Sweet Potato Diet. 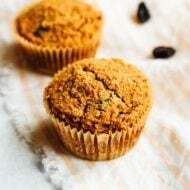 If you make these sweet potato brownie bites let me know how they turn out in the comment section or share a photo on social media. Just be sure to tag me (@eatingbirdfood + #eatingbirdfood) so that I see it! I cannot wait to make these they look so delicious!!! If I wanted to use regular eggs instead, how many would I use? It shouldn’t change the result right? Hi Liv! Sure, just use 2 regular eggs instead of the flax seed eggs. Let me know how they turn out. I was going to ask the same thing. Thanks. Of course, urrite! Everything is better with a little nut butter added! 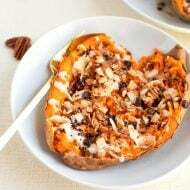 Love, love sweet potatoes, so will try this as soon as my coconut flour is replenished!!! They sound wonderful, thank you- thank you. Yay!! Can’t wait to hear what you think of these little bites. I’m hooked. 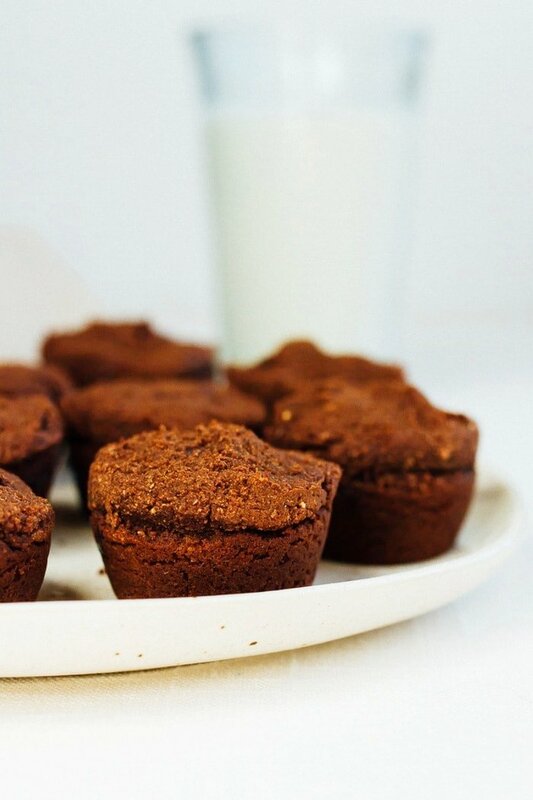 These look great, and yes, everything is better with a bit of almond butter! Thanks for sharing. Yum! I can’t wait to try these! What are your thoughts on adding in some protein powder? Hi Abigail! I’m not sure how protein powder would work but you can definitely try it if you want to experiment! Yummy!!! I can’t wait to bake these when I get home from work today! Yay! How did the brownie bites turn out, Kimberly? Yummy!!! Even my 16 year old son, who is a “regular” brownie lover is loving these! Thank you for the wonderful recipe. Ahhh!!! I’m so happy to hear this, Kimberly! So glad your son is enjoying the brownie bites. Hi Brit. I bought liquid coconut oil–is it the same as coconut oil melted? As someone who has both weight loss surgery (a few years out) and Celiac (newly diagnosed), i can’t wait to try these! However, I’m curious about the maple syrup. Can I substitute it for stevia or will that compromise the flavor/texture? I haven’t tried it with stevia, but I feel like it should work! Let me know if you try it. These look amazing! Love working on all the recipes etc that you post on FB and IG. Can’t wait to try this! 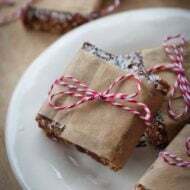 I made these as a treat for myself and the kids and we all loved them. I love that there is sweet potato in them. You’d never know eating them. They are delicious and I’ll be making them again. Yum. Ahh!! So glad that you and your kiddos like the sweet potato brownies. They’re a favorite over here too!